I call homemade chicken broth “liquid gold” in my kitchen. It’s so much more flavorful than anything you can buy in the store. You can adjust the flavors and the salt. Plus, it has all wholesome ingredients, none of the weird stuff that you can’t even pronounce or recognize on the back of the store containers. 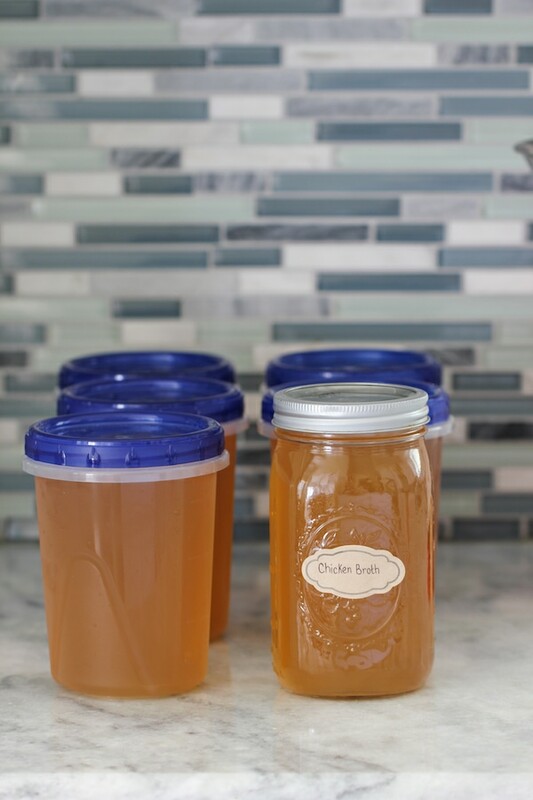 It is the base of so many of my recipes, so I have some chicken broth on hand at all times. I make a giant batch of broth and keep it stored in my freezer. Every few months I replenish my supplies. It really is one of the best foundations for my “flavor factory”. First of all, I put all the vegetables and herbs into the stockpot and move on to the chicken. This way, I can limit touching everything with my raw “chickeny” hands. 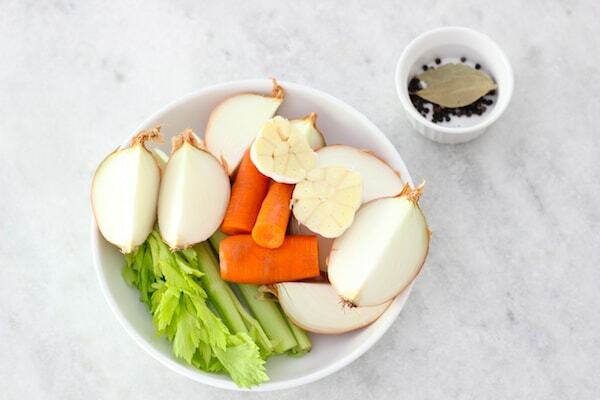 I use very basic ingredients in my broth, but you can add other ingredients too, such as parsnips, celery root, leeks, mushrooms, other vegetables, and fresh herbs, like dill, parsley, thyme, rosemary. It totally depends on your taste preference. I also keep a ziptop bag in my freezer to which I add odds and ends from vegetables that I get when I’m meal prepping. I add those to the broth as well. If I have any chicken pieces that I don’t use when I’m making other meals, such as the chicken backbone, chicken wings tips, chicken breast bone, I store those pieces in ziptop bags in the freezer and add those to chicken broth too. Remove as much of the skin and large fat pockets of the chicken as you can. This is completely optional, but I don’t like chicken broth to be too greasy, so I choose to do this extra step. You can also save chicken parts, freeze them and then use them to make chicken broth when you have the equivalent of one chicken, about 3-4 lbs. I also cut off the chicken breast and the chicken tenderloins and save them to be used in other recipes. 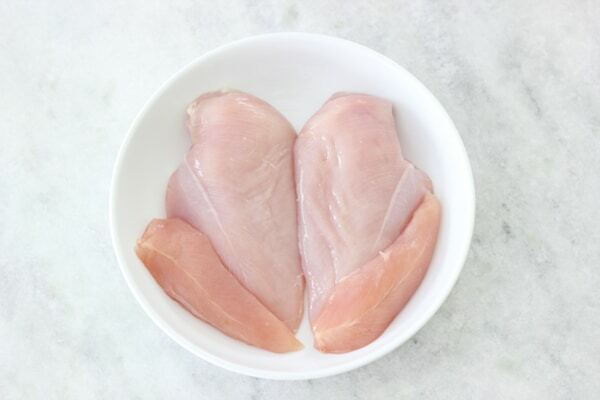 Chicken breast cooks so quickly that by the time the chicken broth would be cooked, the breast and tenderloin will be completely dry and leathery. If you want to use the chicken breast meat, I would remove it after 20 minutes from the broth, so that it’s gently poached and still juicy. Keep the rest of the broth cooking longer. 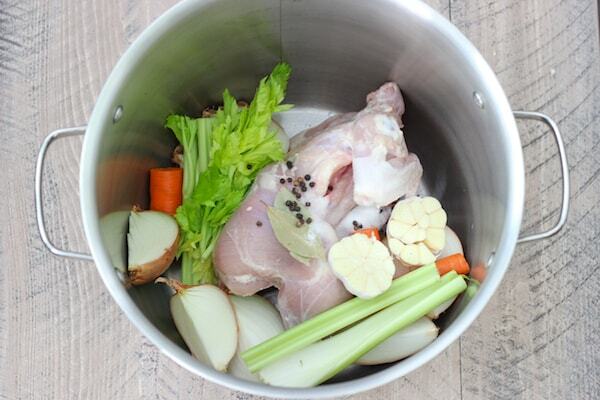 Place the prepared whole chicken, the vegetables, and the herbs into a large stockpot. I use a 16-quart pot, but if your stockpot is smaller, you can still use the same amount of ingredients, your broth will just be more concentrated. 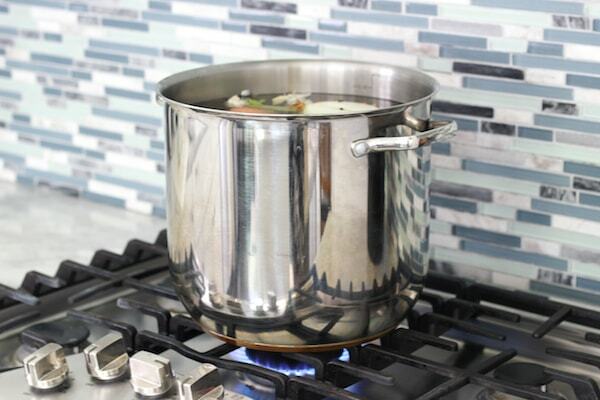 However, if you use a smaller stockpot, you can also halve the ingredient amounts. Fill it to the top with water. (By the way, it’s important to use good filtered water. If your tap water tastes funny, so will your broth:). 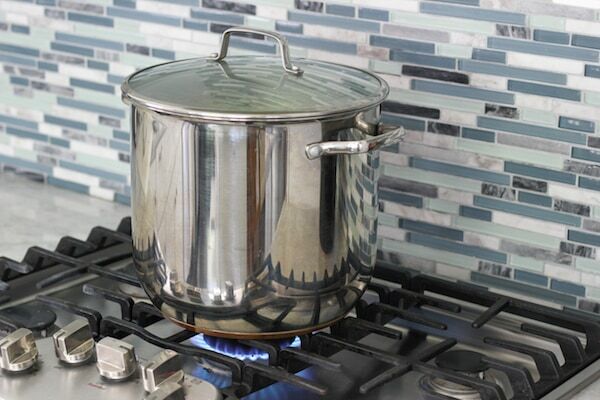 Cover the stockpot with a lid, bring to a boil, reduce the heat to low and simmer for about 1- 1 1/2 hours. Skim off the foam from the top of the chicken broth as it is cooking. Keeping it at a low simmer will give you a clear broth. If you cook the broth on high heat the whole time, the broth will be cloudy. 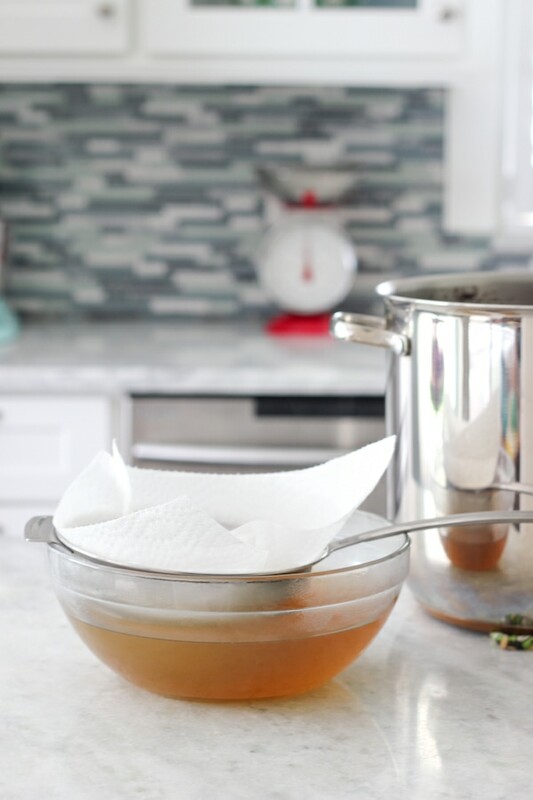 Line a strainer with paper towels, cheesecloth or a coffee filter and strain. 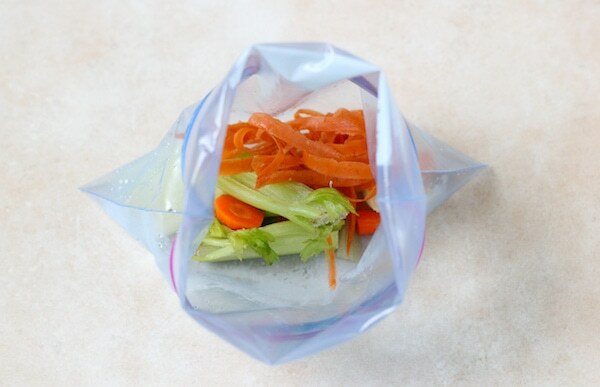 The paper towel will trap all the food particles and fat, leaving you with a beautiful, clear broth. Reserve the chicken meat and use in chicken salad, savory crepes or any other recipes that call for cooked chicken. 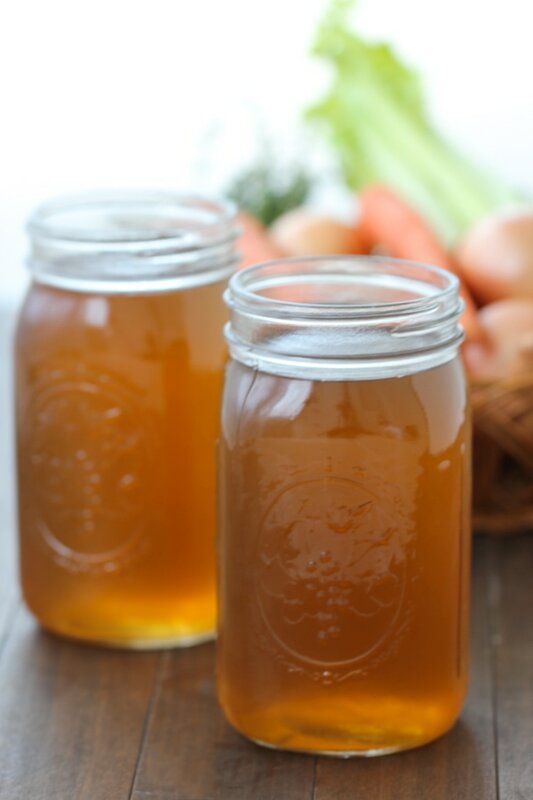 I cool the broth to room temperature and then pour a small portion of it into glass mason jars to be stored in the refrigerator for a few days. The rest I pour into plastic storage containers to be stored in the freezer for up to 6 months. They can probably be stored longer, but chicken broth never lasts longer than that at my house, so I can’t vouch for the time period with certainty. 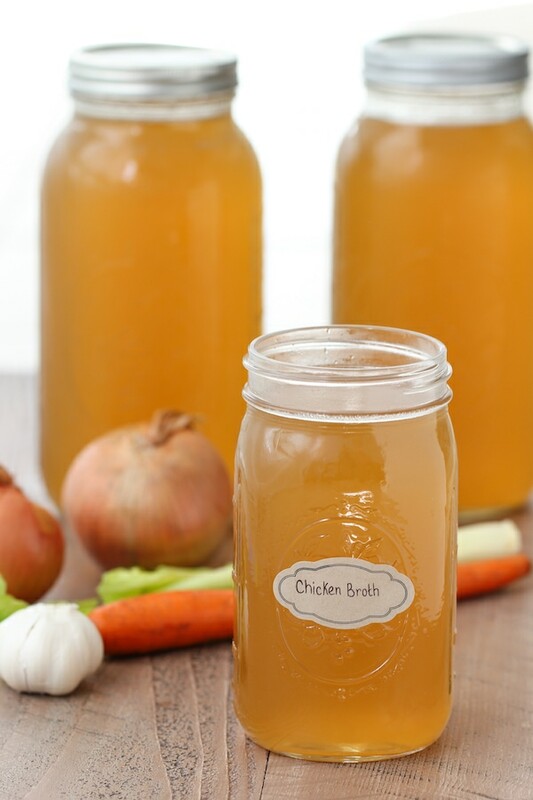 It’s so convenient to have chicken broth on hand all the time. Every time I reach into the depth of my freezer it seems to magically appear. Place all the ingredients into a large stockpot, at least 8 quarts. 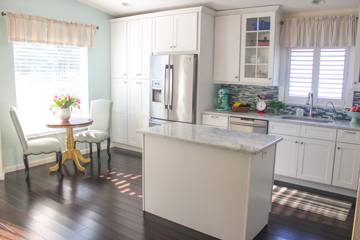 Fill it to the top with good filtered water. Bring to a boil, reduce the heat to low and simmer for about an hour. Skim off the foam from the top of the chicken broth. Line a strainer with paper towels or a coffee filter and strain the broth. I also have recipes for Beef Broth and Vegetable Broth. Check them out below. Made this the other day and it turned out awesome!! Thank You Olga! Also where do you get those plastic containers?? I cant find them anywhere! Those are quart size take-out contatiners. I buy them in a restaurant supply store. If you don’t have one in your area, you can buy them online. They are very inexpensive. Hi Olga! Do you use store bought chicken, or do you buy homegrown/organic ones? I just dont really use cooked meat in anything, and i would feel sad if i had discard so much of homegrown meat. Thank you so much for your quick reply 🙂 ill give the crepes a try. Im just not a big fan of the cooked meat texture. THREE QUESTIONS… WHAT IS PEPPER CORN, WHERE DO I GET IT.. AND WOULD IT MAKE A HUGE DIFFERENCE IF I OMITTED IT FROM THE RECIPIES? PS. LOVE ALL ALL THE EFFORT YOU PUT INTO EXPLAINING ALL THE STEPS!!! Pepper corn is dry whole black peppers, most often used in recipes ground up as ground black pepper. It’s used in almost every recipe, salt and pepper. Whole black pepper corns as great in broths, pickling recipes, etc. You can buy it in every store. If you don’t like using it, you can omit it, of course. I always add it to broths. 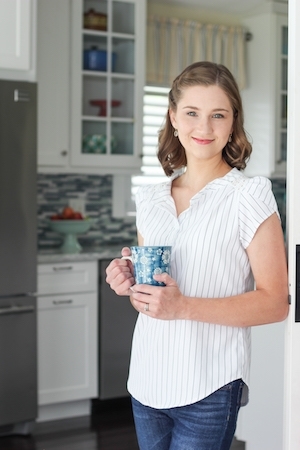 This way, you can almost always have chicken broth on hand. Very smart! I want to try it, but I’m not quite sure how to use it. When you want to use some for a recipe, do you use the frozen broth and just scoop some out with a spoon or ice cream scoop?? I don’t know how much I would need for a recipe, if I would need to thaw it first, etc. You would have to thaw it first. 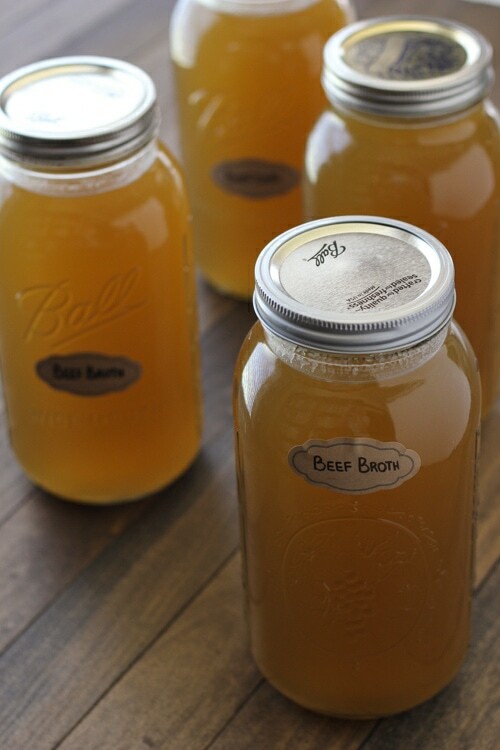 I usually keep a quart of chicken broth in the refrigerator and every time I need more, I thaw another container. I don’t discard the skin before cooking. I skim the fat after it rises to the top of the broth overnight and use it in bread and buns. I usually make a lot of broth at the same time, 3 huge pots, it would take many hours for the broth to cool off and then I wouldn’t have enough room in the refrigerator to store it all. When I make a small batch, I store it in the refrigerator, and skim off the fat later. I rarely ever use chicken fat, though. Good use of it, Good for you. I have some questions for you Olga! How long does the broth last in the freezer? Also, if I needed the broth to make soup, would I add it in frozen and then defrost it in the pot or bring it to room temperature in the fridge prior to cooking? Lastly, if this recipe makes 6 quarts of broth, when you triple this recipe, do you get 18 quart size containers of broth? I use my broth A LOT, so it lasts me for a few months only. You can safely leave it in there for at least 3 months. I usually defrost it on the counter or in the refrigerator. I always have a container of Chicken Broth in the refrigerator and as soon as I see that it’s starting to run low, I take out another container from the freezer. Sometimes, I forget though. A quick way to defrost it, hold the closed container under hot running water just enough so it will come out of the container. Dump it out into a small pot and cook it until the chicken broth defrosts. One of my pots is a little smaller than the other 2 large ones that I have, so I have a little bit less that 18 quarts, but it’s very close to it:). Like I said, I use chicken broth A LOT. You always answer so thoroughly! I appreciate it!! 🙂 I just ordered the 32 ounce containers so I will start making my first Chicken Broth next week! Also, do you use a whole chicken per pot? If so, any ideas what to do with the left over chicken? I use one chicken per pot, without the chicken breast. It turns really tough and rubbery after cooking so long, so I cut the chicken breast off and save it to use in other recipes. I use the cooked chicken in Savory Crepes with Meat Filling. My favorite way to use up Cooked Chicken. Hi Olga, I never made chicken broth before. But, since I had bunch of chicken bone from thighs left over with a little meat, I decided to use them to make the broth instead of trashing them. I haven’t tasted it yet because it’s still hot. But can you pretty much use any bones from the chicken to make the broth? Or it’s better to use the whole chicken? Thanks! Normally, I make chicken broth with the whole chicken, but you can use any bones with some meat on them. Hi Olga! I want to make chicken broth. What containers could I use for it? You can really use any kind of containers, Alina. I buy my plastic take out containers at a local restaurant supply store. I also use glass canning jars – they work really well too. I like to make Savory Crepes With a Meat Filling or Chicken Quesadillas with the chicken that I use to cook the broth. I meant to say what containers would be best to use for freezing chicken broth? 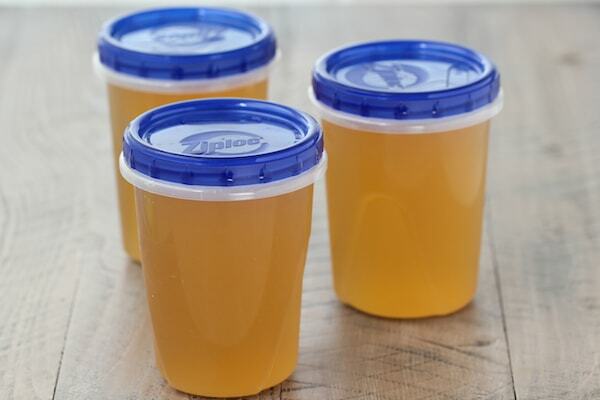 You can use many kinds of containers, such as the ones that I use, glass containers that are safe for freezing, you can freeze chicken broth in ziplock bags, Alina. Hey, I wonder if broth will stay Long if I do like I do for pickling if I sterilize the jars pour hot broth in glass jars and close them up tightly?? Yes, it will last much longer, if you sterilize the jars and then seal them and can the broth properly. I just freeze most of my broth and it will last in the freezer for 6 months or so. Hi Olga, why do you cook it for only one hour? The chicken will be completely cooked through at this point, so that is why I only cook broth for an hour to an hour and a half. I also like to use the cooked chicken in other recipes, so that is another reason why I don’t like to cook it too long. The longer you cook it, the more flavorful your broth will be, but the chicken will be dry and flavorless. You can cook it much longer than that, since the flavors of the broth will only get more concentrated. It’s a personal preference of mine, Tatyana. Oh I see. I cook mine for 12 hours in order to get most of the nutrient out, but I usually just use bones and feet so I don’t feel bad throwing them out lol. But I do agree that overcooking the broth if you’re using a whole chicken is not good. Wow! That’s a long time! You’re right, if using only bones you do need to cook the broth much longer. I agree with you there. Yes, you can use chicken breast, Dina. Did you read the complete recipe? I have a chicken breast option written also. If you use chicken breast, the broth will not be as flavorful, you will need to cook it for much less time and use more meat than if you use dark meat and bones. Also, the cooked meat will be tough and rubbery, so I wouldn’t recommend using it in any other recipes. 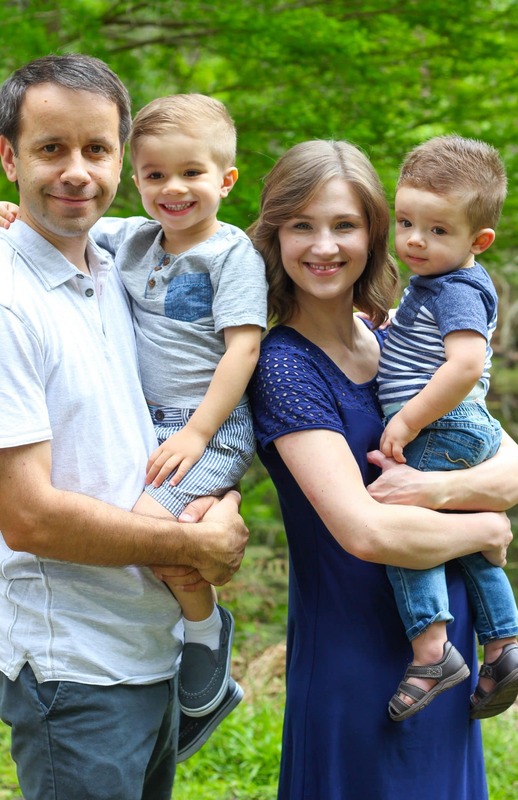 Olga, just came across your awesome website after my wife, who is an American, found this recipe http://www.food.com/recipe/oladi-528732. They turned out great! As I looked through more recipes on your site I came across this one. Please don’t take this as a criticism, I am just trying to share my experiences. Your can call me a health freak, I guess, as I definitely pay attention to the ingredients we use in our cooking and I cook a lot myself, I mentioned that my wife is not Russian 😉 Anyway, I wanted to caution you and others that pouring hot liquids in a plastic containers causes those to leach bisphenol A (BPA) hormone that you will later consume with the broth. I personally don’t even trust BPA free plastics, only use glass and stainless steel – you can also call me paranoid, lol. A good solution is probably to wait till the broth is completely cool before using plastic containers. The other thing is paper towels, most of those are bleached nowadays for whiteness and probably also not a very good option for food preparation. Not exactly sure what an alternative for this one would be. Again, thanks for all the recipes and keep up the GREAT work! Огромное спасибо!!! Hi Alex, I use double folded piece of muslin in a sieve for straining the broth. It can be re-used over and over again provided it gets a good wash after each use. Good comment regarding the use of plastic containers with hot food. 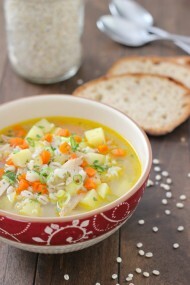 Nice website Olga, it is refreshing to see some good East European cooking. That’s a great idea, Norbert, about the muslin. I often use a cheesecloth as well. I cool off the broth before pouring it into the plastic containers. I like using plastic containers to freeze broth because glass containers can break. Thank you for such an amazing and yummy recipe! May God bless you!